Perfect for home bars and kitchen islands, the Glosco 25" Barstool is a practical add-on to your home furnishings. It features a wide scoop seat supported by sturdy legs that provides prolonged seating comfort. This transitional-style stool is finished in a contrasting two-tone hue, with a distressed top and a smooth bottom. This bar stool is both attractive and functional. The wood is solid and looks great. The curved seat makes it very comfortable for sitting. Highly recommended! We looked at and sat in a large number of stool types and this style fit all the criteria; it’s sleek, it’s not going to wear like the fabric or faux leather stools, they’re sturdy and, they’re comfortable! I love my new stools! I bought these as a housewarming gift for my sister. They are very well constructed and feel very solid. Required assembly, but it was easy and fast. She gets loads of compliments on appearance and how durable they feel. Highly recommend!! I purchased two of these sturdy barstools for our counter-height table. The quality is excellent. Jordan's furniture assembled them before the delivery. The assembly and delivery price was very reasonable. It's wonderful that they can be pushed under the table to create more space in our small kitchen. That's why we bought them. They are comfortable to sit on and our cats don't scratch these at all, thankfully. 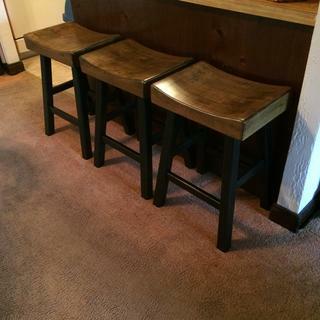 I bought these two stools for our counter top end table in the kitchen. They are very steady, easy to assemble, very comfortable. Would recommend this stool to anyone!! We bought two of these stools to put at our counter-height breakfast bar, and they are a perfect fit! So comfortable and aesthetically pleasing. Highly recommend! These stools were exactly what I was looking for. The price was reasonable and they are high quality.